Louis Braille (January 4, 1809 – January 6, 1852) was the inventor of the braille writing system, the world-wide system used by blind and visually impaired people for reading and writing. Braille is read by passing one's fingers over characters made up of an arrangement of one to six embossed points. It has been adapted to almost every known language and dialect throughout the world. 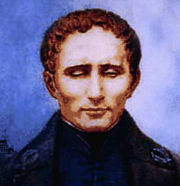 Louis Braille, himself blinded at the age of three, developed his system as an improvement on the books used at the school he attended for the blind. Braille's invention overcame the limitations of the old system, incorporating a code he learned from a soldier and modified to be simple enough for all to learn. Braille's contribution, opening the doors to the written word to the blind the world over, is one of immeasurable value to humankind. Louis Braille was born on January 4, 1809, in the small village of Coupvray, near Paris, France into the family of Simon-René and Monique Braille. His father made harnesses and different leather goods, and young Louis used to play in his workshop. One day, while playing with an awl, the tool accidentally poked his eye, which in the beginning seemed a minor wound. The wound however became infected and Braille soon lost sight in both of his eyes. He was three years old. Braille started his education normally for his age, going to school together with his friends. At the very young age of ten, Braille earned a scholarship to the Institution Royale des Jeunes Aveugles (Royal Institution for Blind Youth) in Paris, one of the first of its kind in the world. The scholarship was his ticket out of the usual fate for the blind—begging for money on the streets of Paris. However, the conditions in the school were not notably better. Braille was served stale bread and water, and students were sometimes abused or locked up as a form of punishment. Braille, a bright and creative student, became a talented cellist and organist in his time at the school, playing the organ for the church. At the school, the children were taught basic craftsman skills and simple trades. They were also taught how to read by feeling raised letters (a system devised by the school's founder, Valentin Haüy). However, because the raised letters were made using paper pressed against copper wire, the students never learned to write. Another disadvantage to these raised letters was that the pages were heavy and took much time to produce. Books using this system were published contained multiple stories in order to save money, becoming too heavy for the young students to lift. In 1821, Charles Barbier, a former soldier visited the school. Barbier shared his invention called "synography" a code of 12 raised dots and a number of dashes that let soldiers share top-secret information on the battlefield without having to speak. Although the code was too difficult for the average soldier, Braille picked it up quickly. That same year, Braille began inventing his raised-dot system with his father's stitching awl, finishing at age 15. His system used only six dots, with each group corresponding to letters, whereas Barbier's used 12 dots corresponding to sounds. The six-dot system allowed the recognition of letters with a single fingertip apprehending all the dots at once, requiring no movement or repositioning which slowed recognition in systems requiring more dots. The dots were organized into patterns in order to keep the system easy to learn. The braille system also offered numerous benefits over Haüy's raised letter method, the most notable being the ability to both read and write an alphabet. Another very notable benefit is that because they were dots just slightly raised, there was a significant difference in the weight and ease of production of the pages. Braille later extended his system to include notation for mathematics and music. The first book in braille was published in 1827 under the title Method of Writing Words, Music, and Plain Songs by Means of Dots, for Use by the Blind and Arranged for Them. Braille became a teacher at the Institute in 1829, teaching grammar, geography, arithmetic, and music. He was well admired and respected by his pupils. Braille continued to revise and perfect his system, adding letter “w” and removing the dashes. In 1839, Braille published details of a method he had developed for communication with sighted people, using patterns of dots to approximate the shape of printed symbols. Braille and his friend Pierre Foucault went on to develop a machine to speed up the somewhat cumbersome system. 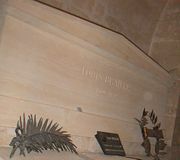 Braille's tomb in the crypt of the Panthéon. The air at the Institute was foul and unhealthy, and many students became sick. Braille’s health also suffered, and he died of tuberculosis in 1852 at the age of 43. His body was disinterred in 1952, one hundred years after his death, and honored with re-interment in the Panthéon cemetery in Paris. The significance of the braille system was not identified until 1868, sixteen years after Louis Braille died. Thomas Rhodes Armitage and a group of four blind men and one woman established the British and Foreign Society for Improving the Embossed Literature of the Blind (later the Royal National Institute of the Blind), and began publishing books using the braille system. A world congress that met in Paris in 1878, selected the braille system as the official system of reading and writing for the blind. By 1890, braille was adopted in schools for the blind in Spain, Germany, Austria, Belgium, Denmark, and England. In 1917, the United States started to use braille in its schools, and in 1949, the United Nations began to adapt braille to more than two hundred languages throughout the world. Braille, Louis. 1829. Method of Writing Words, Music, and Plain Songs by Means of Dots, for Use by the Blind and Arranged for Them. Meyer, Carolyn. 1995. A New Method: The Story of Louis Braille Louis Braille School. Retrieved November 12, 2007. The Power of Braille National Braille Press. This page was last modified on 25 July 2018, at 22:39.